Have you woken up to find itchy bites on your skin? Have you noticed small spots of blood on your sheets? These are a couple of common signs that bed bugs may be lurking in your home. There are certain things that you can do to try to spot bed bugs on your own, but if you have tried everything and you still don’t see them, you may still have a bed bug problem. 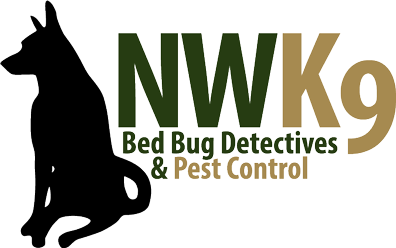 If you want the peace of mind that you need to rest easy then you need to rely on Northwest K9 Bed Bug Detectives. We offer professional bed bug inspections in Seattle like you won’t find with any other company. Many other companies perform visual inspections to find bed bugs, and while this may suffice if you are a highly trained individual, our eyes will only be able to catch so much. That is why we believe that our bed bug dog inspections are a much better alternative. Our talented dog, Magic, is able to detect a bed bug with just a single drop of urine! Our detection dog has an incredibly impressive accuracy rate of 97%. If not caught early on, bed bug infestations can quickly get out of control, and they can cause a great deal of stress for those affected. You don’t have to face those bed bugs alone! If you have tried everything to spot those nasty little bed bugs with no luck, then don’t just assume that your home is bed bug free. Your next step is to get a professional inspection. Give yourself the peace of mind that you need by giving us a call today to schedule your inspection.